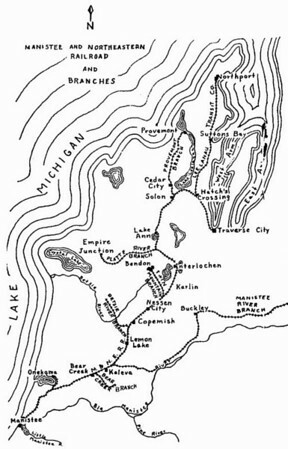 The Manistee & Northeastern Railroad linked many area towns and cities in the first part of the 19th century. It started service in Traverse City in 1892. The Manistee River Branch at the right side of the map went to Grayling. The Pere Marquette Railroad took it over in the early 1930s and continued to operate the Provement to Solon and Traverse City to Northport routes until 1944.